H. Rider Haggard (1856-1925) was born to a father who was a barrister and a mother who was an heiress of a considerable fortune from the East India Company. Haggard, at 19, moved to South Africa to work as a secretary to Sir Henry Bulwer and eventually became the Master of the High Court of the Transvaal. However, he eventually became disgusted at the concessions he believed Britain was giving to the Boers and left South Africa for England, where he trained and qualified for the Bar, but the work didn’t please him. In early 1885, Haggard’s brother bet him that he couldn’t write as good a story as Robert Louis Stevenson’s Treasure Island, which resulted in Haggard producing King Solomon’s Mines just four months later to great success an an immediate bestseller. This was the start of the Alan Quatermain saga. Travelling by oxcart, they reach the edge of a desert, but not before a hunt in which a wounded elephant claims the life of a servant. They continue on foot across the desert, almost dying of thirst before finding the oasis shown halfway across on the map. Reaching a mountain range called Suliman Berg, they climb a peak (one of “Sheba‘s Breasts”) and enter a cave where they find the frozen corpse of José Silvestre (also spelt Silvestra), the 16th-century Portuguese explorer who drew the map in his own blood. That night, a second servant dies from the cold, so they leave his body next to Silvestra’s, to “give him a companion”. They cross the mountains into a raised valley, lush and green, known as Kukuanaland. The inhabitants have a well-organised army and society and speak an ancient dialect of IsiZulu. Kukuanaland’s capital is Loo, the destination of a magnificent road from ancient times. The city is dominated by a central royal kraal. They soon meet a party of Kukuana warriors who are about to kill them when Captain Good nervously fidgets with his false teeth, making the Kukuanas recoil in fear. Thereafter, to protect themselves, they style themselves “white men from the stars”—sorcerer-gods—and are required to give regular proof of their divinity, considerably straining both their nerves and their ingenuity. They are brought before King Twala, who rules over his people with ruthless violence. He came to power years before when he murdered his brother, the previous king, and drove his brother’s wife and infant son, Ignosi, out into the desert to die. Twala’s rule is unchallenged. An evil, impossibly ancient hag named Gagool is his chief advisor. She roots out any potential opposition by ordering regular witch hunts and murdering without trial all those identified as traitors. When she singles out Umbopa for this fate, it takes all Quatermain’s skill to save his life. Gagool, it appears, has already sensed what Umbopa soon after reveals: he is Ignosi, the rightful king of the Kukuanas. A rebellion breaks out, the Englishmen gaining support for Ignosi by taking advantage of their foreknowledge of a lunar eclipse to claim that they will black out the moon as proof of Ignosi’s claim. (In early editions, this was a solar eclipse; Haggard changed it after realising that his description of a solar eclipse was not realistic) The Englishmen join Ignosi’s army in a furious battle. 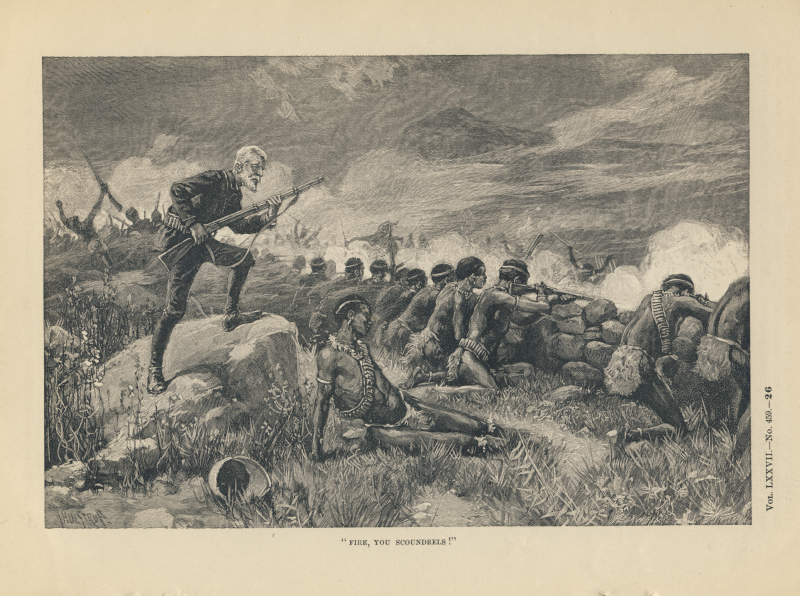 Although outnumbered, the rebels overthrow Twala, and Sir Henry lops off his head in a duel. 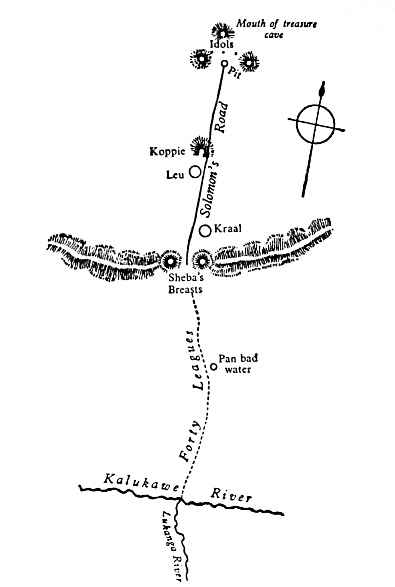 The Englishmen also capture Gagool, who reluctantly leads them to King Solomon’s Mines. She shows them a treasure room inside a mountain, carved deep within the living rock and full of gold, diamonds, and ivory. She then treacherously sneaks out while they are admiring the hoard and triggers a secret mechanism that closes the mine’s vast stone door. However, a brief scuffle with a beautiful Kukuana woman named Foulata—who had become attached to Good after nursing him through his injuries sustained in the battle—causes her to be crushed under the stone door, though not before fatally stabbing Foulata. Their scant store of food and water rapidly dwindling, the trapped men prepare to die also. After a few despairing days sealed in the dark chamber, they find an escape route, bringing with them a few pocketfuls of diamonds from the immense trove, enough to make them rich. According to Dennis Butts’s “Introduction,” Haggard came under criticism for his repeated use of violence across most of his fiction (xv). This is especially the case in King Solomon’s Mines. For example, The Church Quarterly Review noted that the they “looked upon the repetitive introduction of scenes of slaughter…as a violation of the decency we have a right to demand from all who handle such solemn themes” (qtd. in Butts xv). However, in his autobiography, Haggard stated that “man is a fighting animal” and therefore, in order to maintain realism in his works of fiction, violence was a necessary feature (ibid.) Butts states that this thinking ties Haggard to the post-Darwinian climate of thought in England at the time (xvi). In order to write an effective adventure story, Haggard states that it should be written rapidly to ensure that the atmosphere of the story is not lost (“The way to write a good romance is to sit down and write it almost without stopping”) (Butts xiv). This is very similar to Poe’s vision of reading romances and poetry, in which the reader must be able to complete the task in one sitting within a sealed environment. I also think it’s interesting that Haggard should equate the adventure story with the romance. Considering what I know of the gothic romance, this does make sense since so much relies on the affective and sensual experience of reading the narrative in both genres- the gothic and the adventure. For Haggard, he wanted the “grip” to be present throughout the experience of reading his adventure novels. Finally, Butts notes the strange position Haggard takes in King Solomon’s Mines on imperialism. The novel ends in the return to normalcy, order, and control as defined by the British characters, and there are many racist assumptions underlying the entire story, however, throughout the novel there is an amount of respect given to the native characters that is not seen in other literature of the time. For example, Sir Henry and Umbopa are both aristocrats and seem to share an immediate sense of their brotherhood. The novel also ends with the promise that no other white people will enter Kukuanaland. According to Butts, Haggard had a deep concern that these other cultures were slowly dying due to imperialist ventures. He also feared that the British culture was dying from the same cause (xvi-ii). In the opening chapter, Quatermaine promises the reader that “there is no woman in it- except Foulata. Stop, though! there is Gagaoola, if she was a woman and not a fiend. But she was a hundred at least, and therefore not marriageable, so I don’t count her…I can safely say that there is not a petticoat in the whole history” (10). This promise may have been made for the boys of all ages to whom Haggard and his publishers aimed the novel in order to fully solidify its status as a masculine adventure story. It also serves to inform us what qualifies as a “woman” to Quatermaine- she must be marriageable and race also seems to come into play here. Although Foulata is young and beautiful, he almost forgets her presence in the story here presumably because of her race and Quatermaine’s own discomfort with interracial coupling. However, there are women throughout the novel, from the land itself (“virgin” territory, unmastered by white men, and drawn in a map as having a female form), to Gagaoola’s witches and the countless ladies of Kukuanaland. In the opening chapter, Quatermaine defines the story he is writing in different terms- as a “history” (9), a “yoke” (10), and a “book” (10). Throughout the novel, he encounters other types of stories, including the fictional “yarn,” “story book” or “queer story” (22), and the “writings on the walls of caves” (78) that he discovers in Kukuanaland. He and his crew of British adventurers also use fiction to their advantage, first concocting a folk tale of their background, stating that they came from the stars, and later pulling from such texts as the Ingoldsby Legends in order to sound threatening and serious as they attempt to prove their supernatural status by killing the sunlight for an hour (they knew that there would be an eclipse due to the information provided by another text, Good’s almanac, which, after a debate, they decided to believe) (“We Give a Sign”). This fits well with the fictions and texts encountered in other Victorian narratives of this time, including The Story of an African Farm and The Way We Live Now because these narratives become a sort of credit that the characters produce and sell in order to create their own public identities and to get ahead in whatever predicament they find themselves (and, ultimately, to get rich). Although only two of the main characters are true aristocrats, Quatermaine is able to achieve a godly status because of his ability to quickly spin yarns, just as the hunters he encounters earlier in the novel use the art of spinning yarns to earn their status as great hunters. King Solomon’s Mines (1885) by Caitlin Duffy is licensed under a Creative Commons Attribution-ShareAlike 4.0 International License.